Bentley presented for a new lameness in his left thoracic limb which was isolated to his shoulder region. He was treated with acupuncture over several sessions. He responded well after the first treatment with marked improvement in his lameness. Bentley received 2 follow-up sessions and now comes in as needed for maintenance. After the first 3 sessions, the lameness was fully resolved and his overall comfort and mobility was improved. Thus, acupuncture is an excellent modality for treating soft tissue injuries of the shoulder and I will continue to use it in the future. Bentley is a 10.5 year old neutered male Lhasa Apso. He presented for a new lameness in his left thoracic limb which had been getting progressively worse over the past month. The owner did not note any specific trauma/injury that caused the lameness. He has been reluctant to go on walks since the lameness started. In addition, he has a history of chronic bronchitis. A few weeks prior to the new lameness, he had a flare up of the bronchitis with increased coughing. Bentley has no history of trauma or orthopedic surgeries. He, however, has a history of osteoarthritis and stiffness in his pelvic limbs. In addition, he has had historical elevation in his liver enzymes. On initial presentation Bentley was not as bright and interactive in the exam room as he usually is. His posture was guarded and slightly withdrawn. His physical examination showed mild muscle wasting over the hips and pelvic legs. He was overweight with a body condition score of 6/9. Gait analysis showed a head bob with right thoracic limb (RTL) placement and a III/V lameness in the left thoracic limb (LTL). He also had mild reduction of pelvic limb flexion. Moreover, his weight was shifted to the right thoracic limb. His initial pain score using the Colorado State University Canine Acute Pain Scale was ¾. Radiographic imaging of the LTL showed osteoarthritis in the shoulder. His neurologic examination was normal with conscious proprioception, hopping and placing intact in all four limbs. All orthopedic reflexes were intact. No cross extensor reflex was elicited in either pelvic limb. The myofascial exam of his LTL showed extremely tense triceps m. bellies with multiple trigger points (TrPs) and taut bands. Furthermore, he was reluctant to extend the shoulder and could only extend it ~30 degrees. The supraspinatus and infraspinatus mm. also had multiple TrPs. In addition, all antebrachial extensors had taut bands on palpation. All flexors, however, were relaxed with no palpable tenderness or TrPs. The distribution of the latissimus dorsi on the left side was markedly tense and he resented palpation of those muscles. The rest of the myofascial exam showed tenderness/twitching over T10-L3 bilaterally on palpation of the longissimus mm. and the origin of the latissimus dorsi. There was, however, no tenderness or compensatory strain patterns palpable on RTL. There was mild tenderness on palpation of the hips. On axial exam, he was reluctant to turn his head in any direction, and the spine was held rigid. Based on physical exam findings which showed myofascial pain and reduced range of motion but no neurological deficits and a lack of radiographic findings beyond osteoarthritis, a putative diagnosis of soft tissue injury of the shoulder was made. The approach to the points I chose was based on the myofascial exam by treating specific tender points and using the MAIN technique to balance the selection of the local points with central, peripheral, and autonomic nervous system. Local points facilitated the release of myofascial restrictions in tender areas. Central points used were at spinal segments to influence the involved region. Autonomic points were utilized to help reregulate his system to a more parasympathetic state and release endogenous opioids. Peripheral points stimulated the various nerves and blood vessels to effect change proximally. Bentley had an initial course of 3 treatments, over which he showed remarkable improvement. At the end of the third treatment, he had no apparent signs of lameness and was comfortable on range of motion and myofascial palpation. His neurological exam remained normal. TrPs in the triceps, infraspinatus, supraspinatus and longissimus mm. were treated with hwato 0.16x25mm needles. Gait was significantly improved after with mild lameness remaining (I/V). He was more willing to move his neck. He was comfortable on palpation of the triceps and latissimus. A reassessment of pain score showed 0-1/4. Adjunctive therapies instituted were gabapentin 100mg PO q12h. The second session occurred 5 days later. The owner reported that Bentley’s signs were much improved. He still had mild lameness, but it was considerably less than before. He would go on short walks and felt more himself. After being groomed yesterday, however, he has regressed and seems much sorer. The exam showed a mild head bob when stepping on RTL. The LTL had a shortened gait and he was not willing to extend his shoulder. The triceps m. bellies had multiple taut bands with many TrPs. The latissimus dorsi on the left side twitched on palpation. There was mild tenderness over T12-L3 bilaterally. His pain was rated at 2/4. Myofascial: SI 11 (see RTx1), SI 9 (targets axillary n. which innervates the shoulder joint), LI 10 (stimulates radial n. and some extensor mm. ), BL 20, 21, 22, 23 (see RTx1), local tender points along latissimus dorsi m.
Post treatment there was no apparent lameness (0/V) and he was comfortable on palpation of triceps, latissimus and longissimus mm. Moreover, he turned his head freely while exploring the room. Reassessment of pain score showed an improvement to 0/4. Adjunctive therapies were to continue the gabapentin and for the owner to massage over the distribution of the origin of the latissimus dorsi and triceps area. A demonstration of how to correctly perform petrissage, compression, and effleurage was conducted for the owner. The third session occurred 1 week later. The owner reported that Bentley was doing great, felt better overall, and the lameness had resolved. He was eager to go on walks again. They, however, had gone on a very long walk last night and now he seemed sore again. His exam showed only mild taut bands of the triceps bellies and over the latissimus dorsi distribution. He freely moved his head/neck around and his spine had supple movement during walking. He had a II/V lameness in LTL. No head bob was present. Initial pain score assessment was 1/4. Post treatment, there was no appreciable lameness on the LTL (0/V). Bentley was comfortable on myofascial examination. His pain score was rated at 0/4. Shoulder extension after this session was in a normal range of motion of 65 degrees. Adjunctive therapies were to continue the gabapentin and at home massage. Follow-up acupuncture appointments would be conducted as needed. Bentley’s outcome was excellent, and the owner was very pleased. Prior to his treatment, he did not want to go on walks, or play with his toys. The owner felt his quality of life was greatly diminished. Throughout the treatment period (and continuing to today) he is more interested in walks, plays with his toys, and the owner reports his overall well being has improved. He went from a III/V lameness to a 0-1/V lameness (depending on how his osteoarthritis was doing and if he had recently overexerted himself). Additionally, his pain score went from an initial 3/4 to a 0/4. His extension range of motion improved from a very limited 30 degrees, to a normal 65 degrees. While gabapentin was used during treatment, he had been on it in the past for osteoarthritis flareups. The owner had used it off and on during the few weeks of lameness prior to presentation with no improvement. I believe the acupuncture was the main cause for improvement in his lameness and pain in the LTL. This case was one of the first cases I had after attending the onsite session and taught me a great deal. Before acupuncture, I would have treated Bentley with a variety of pain medications and perhaps a muscle relaxer. While this protocol would have addressed his pain, it would not have addressed the underlying cause of the pain – myofascial dysfunction. 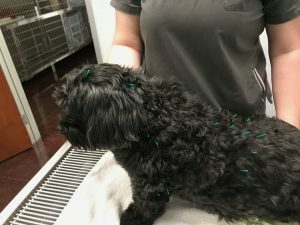 By using acupuncture on Bentley, this underlying dysfunction was addressed, which allowed for a better treatment outcome. He had no adverse effects after treatments except for a little sleepiness. One adjustment I would have made to the initial treatments would have been to use more peripheral points. Since those initial treatments, I have now included in his ‘tune ups’ additional peripheral points such as LU5 to add an additional distal point specific for the radial n. to help with antebrachial extensor tightness. Only a small number of scientific papers have been published regarding shoulder pain and acupuncture. The few that are available in the literature show it to be a promising treatment for soft tissue shoulder injuries. Itoh et al. (2013), performed a preliminary study on the use of TrP acupuncture for the treatment of chronic shoulder pain. The results showed a great increase in shoulder function and decrease in pain by treating local TrPs over a 5-week period. Srbely et al. (2010), investigated the impact of dry needle stimulation of myofascial triggers points. Their investigation of the supraspinatus and infraspinatus mm. illustrated that stimulation of the TrP evoked a short-term segmental effect, which had anti-nociceptive effect. Looking to future cases in clinical practice, I will reach for acupuncture first with shoulder pain. Bentley had such a dramatic improvement in his quality of life by improving his myofascial function and decreasing his overall pain levels.